There’s a sizeable difference between closing deals with the Fortune 500’s of this world and the smaller opportunities that fill your sales pipeline. Firstly, there’s the prestige that comes with signing on a big client. Now I’m sure you’ve got it set up within your team so that when a deal is closed, people know about it. At ForceManager we have a specific Slack channel that serves this purpose. Once a sale’s been made the rep’s name is highlighted along with the client’s industry, contract type and of course, size. Because in the game of closing deals, size matters. $1m is simply more impressive than $1k. However, it isn’t just prestige that comes with closing big deals but also the way in which the sales process must be approached. During larger sales cycles you sell to a complex network of people rather than a single decision maker. Relationships need to be built and carefully nurtured over a longer period of time meaning your strategy needs to reflect that change. As field sales managers, this is where we earn our keep. Through our ability to build trust, credibility and a little bit of faith with our clients, we can help our team land those deals that can truly change the face of our companies. Before breaking down the networks behind these bigger deals, we must first learn how to properly interact with the key players behind them. According to Shane Gibson in his book Closing Bigger, 98% of the big deals closed are done through what he calls the Tier 3 Level of Selling; essentially a consultative, needs analysis approach. This means field reps need to have a thorough understanding of the strategic nature of the prospective buyer’s business in order to offer some level of consultation. An increasingly popular method of closing deals of this nature is to be disruptive. Many field sales teams try to offer consultation that’s insightful, more effective and could completely change the way a prospect views their business processes. It’s a bit like your mom offering advice before going on to the field to play a game of football. The intention’s there, but your mom probably lacks the authority or credibility (in your eyes at least) for you to act upon on it. And so it goes with business – without first establishing credibility and rapport, you’re not yet in a position to offer a client disruptive advice on how to better their business. The key to earning a client’s respect and closing deals lays in your ability to conduct a needs analysis by asking the right questions at the right time. In his podcast Sales Questions That Close Deals Gibson states that “great conversations have to have contrast.” In other words, that in order to have a meaningful, enlightening conversation with a prospective buyer, you’ll need to ask a mixture of open-ended, closed, request and leading questions. Much like you would in a general conversation with your best friend or partner. Explain to me, how this problem is negatively impacting your business? What are the goals and objectives of your team? If you don’t solve this issue soon, what are the long-term impacts to your business? They are great – they allow you to build up a quick rapport with the prospective buyer, find out some of the challenges they are facing and sometimes uncover information you’d previously not considered. But alone they are not going to help you in closing deals. A results-focused, straight-to-the-point director is going to need something more concrete than that. If not, you’ll find they will tail off in frustration or boredom. How many people do you expect to use the product? What would be an expected onboarding date if you chose this product? How long has the problem persisted throughout your business process? How are you currently dealing with the situation? So having a reliable system to combat this issue might make sense, wouldn’t you agree? Exactly how many of your team will we be looking at? What you DO NOT try and do during this process is sell. The prospective buyer will see straight through you, concluding that you aren’t asking them questions to help them, you’re just interested in peddling your product whether it’s the appropriate solution or not. They then shut up shop and make extracting information extremely difficult. Based upon what you’ve told me so far, would you mind if I shared with you how I think we can help? By asking the first two questions you are making it clear to the prospect that the need analysis is now closed. You have listened intently and, based on your experience, knowledge and time working with similar customers are able to go ahead and ask the third and final question – Do I have permission to share how I think we can help? Because you took the time to listen carefully to the prospective buyer, you established enough rapport and credibility to step in as a consultor. In fact, if done correctly you as the field sales manager (expert) are almost able to write a kind of story, which identifies a need and positions your product as the solution. But instead of you telling the customer, through the responses to the questions you asked the buyer ends up narrating it themselves. Of course this isn’t to say that following this system leads to closing deals every time you meet with a prospective buyer. Sometimes your product won’t be the right solution and when this happens, recommend them to someone who is. Now it might sound crazy, but this will further build your credibility and perhaps lead to a long-term relationship down the line, either with them or a company they in turn recommend to you. Also, if you are unable to close the deal, make sure at the very least to give goals for sales reps to close the next step, setting up a follow-up meeting with a concise agenda. This cuts out that back and forth process which cause the majority of big deals to get lost over time. As I mentioned earlier, any complex, long-term project is going to have more than one decision maker in the buying process. Who are their biggest influencers? How can we bring them onside? 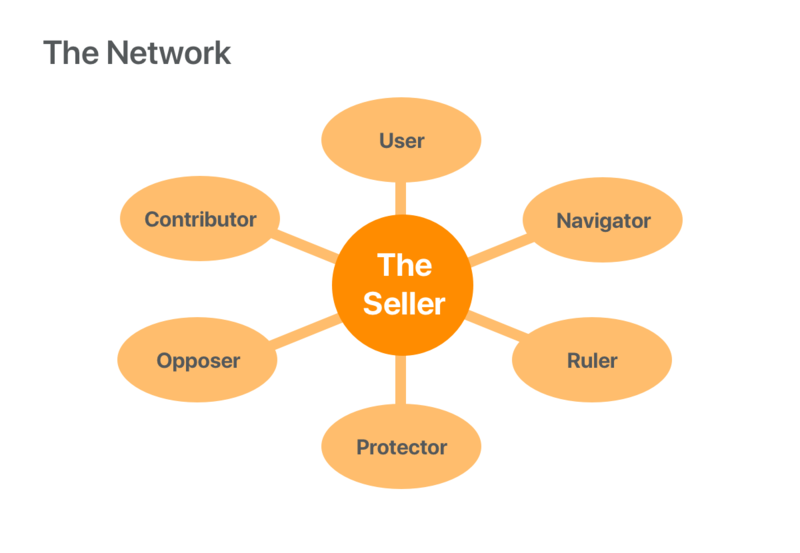 How can we achieve complete buy-in from the entire buyer’s network? If you focus solely on a single member of this network, you open yourself up to the risk of them being fired or moved over to a different department. You’re then left to deal with a power structure that you left neglected and will probably cost you the deal. The Rulers: they can be a single person or operate by consensus as a team. Whichever it is, you’ll need to find out and get them onside as quickly as possible – they will probably hold the final purchase decision. The Navigators: the people that can put you in contact with the rest of the power network. They hold the keys to all the information such as to who else might be vying for the same contract, who might an Opposer and how best to deal with them. They will generally help you out if they feel you have the best interests at heart, a bit like a gatekeeper you might have encountered on a typical cold call. The Opposers: the ones that make closing deals difficult – a real thorn in your backside. For whatever reason they have a grudge against you or your product, maybe because an ex colleague or friend of theirs is competing for the same contract or perhaps they just don’t like you…whatever it is, make peace and bury the hatchet as soon as possible – they could be involved later after the deal is closed. Appease to their concerns in a positive manner meaning that if their opposition is purely based on emotion, they’ll be forced to counter with a logical, business-first argument. The Protectors: although rarely able to give the green light on any large transaction, they do have the power to say no. If you’re dealing with a product integration, for example, these will be the guys brought in to offer technical advice. If they don’t like it, you’re burned. In other situations it could be the Legal or Research and Development departments. Dealing with Protectors is a lot like executing a sales pitch; take them through the steps one at a time like we discussed in our needs analysis section, before explaining why you believe your solution is the best fit. Doing so will undoubtedly lead to closing deals you previously thought lost. The Contributors: our final group is usually the group of influencers that have the ear of the ruler. They could be third-party consultants, advisors or respected colleagues. Again you’ll need to build up a good rapport with these people as they are not just going to promote your cause on a whim, so the more time and experience they have with you and your product, the more likely they are to help you in your cause. Once you’ve established the network behind the deal, it’s time to map them out on a board, excel grid or even a shared Drive document. Keep track of who has been spoken to, when and by who. This will prove vital in strengthening your relationship and credibility with each of these individual groups. Would you propose to someone you’d been dating for all of three weeks and reasonably expect them to smile, jump for joy and finally say…YES! I do? Probably not, and it’s exactly the same in sales. Sometimes we get carried away with the initial optimism felt after a couple of successful conversations with the prospective buyer, causing us to get all giddy inside. Before we know it, we’ve blurted something regrettable out and watch through tear-blurred eyes as they reel away from our overzealous advances. 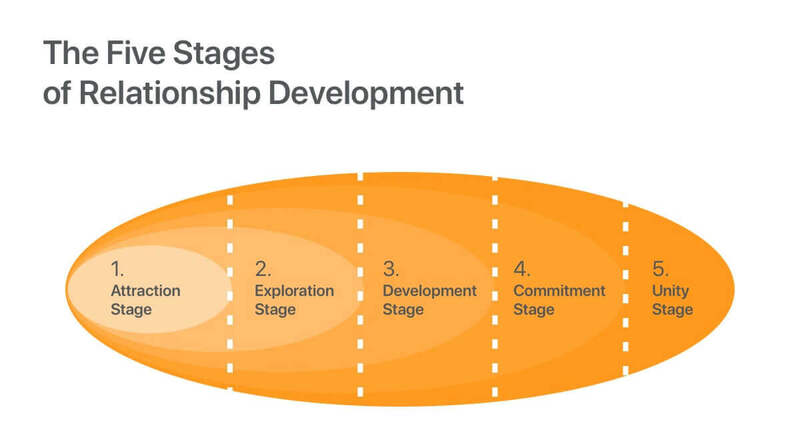 Closing deals of this magnitude is about getting an accurate read on which stage of the relationship development chart each of the power network are at. By probing and evaluating their behaviour towards you you’ll know whether to bump them up to the next stage or not. As you can see each relationship we have with a member of the power network goes through five stages. Attraction: You begin a little “flirting” with the client, forming a first opinion of one another and deciding whether there’s anything traction for which to move forward. Exploration: After a little more qualification, you begin to ascertain whether there’s any common ground to justify further interaction. Development: A certain level of trust and credibility has been established as you begin to “earn the right to earn that business”, as Gibson puts it. Commitment: There’s definitely something strong and stable here, perhaps you’re even looking at splitting a mortgage? You’ve likely become the leading choice of those bidding the contract. Unity: Ding dong, ding dong…the wedding bells have rung! A relationship is established where both seller and buyer have a mutually important relationship critical for the long-term success of the business. The most important thing to take away here is that closing deals that make the rest of your sales team green with envy only happen between stages FOUR and FIVE. Each and every member of the power network will have to be taken through this courting process. You can’t force it; if the buyer is hovering tentatively between the attraction and development stage they are not going to be receptive to your marriage proposal (long-term contract deals) meaning it will all end in tears. So in conclusion, what are the key takeaways here? Closing deals with larger clients means dealing with a complicated network of people, probably the key differentiator between everyday sales. Once the network is established they need to be courted through the appropriate relationship stages built on a strong base of both trust and credibility. Get all those three little ducks in a row and I guarantee your team will be closing deals that will change the face of your business forever. Want to Stop Losing Time Driving Between Sales Visits?